Reducing the lower abdominals is a multi-step process. Lower abdominal fat is a source of dismay for some people. Although it’s impossible to target where you lose fat, you may encourage lower abdomen fat loss through cardiovascular exercise; strengthening abdominal muscles through specific exercises can tone the area so that fat loss reveals nice, firm muscles. 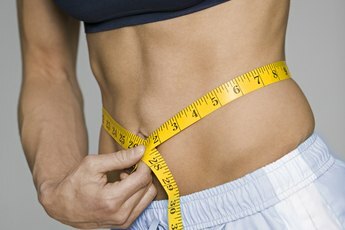 While lower ab fat may be difficult to eliminate, with dedication and a healthy lifestyle, you’ll soon be sporting a flat and trim stomach. While you could have a beautifully sculpted abdominal region, if the lower abs are covered in fat, then you’ll never enjoy this definition. Although standard cardiovascular exercise promotes overall fat loss, research outlined by the American Council on Exercise states HIIT workouts target abdominal fat by increasing insulin sensitivity. Moreover, this workout mode reduces subcutaneous fat, which is the fat that rests directly underneath your skin. HIIT involves cycling between high intensity and medium intensity movements. Intensity levels are rated one to 10, or lowest to greatest exertion. After warming up for five minutes, cycle between 60 second energy bursts with a seven to nine exertion level, and 120 second recovery periods with an intensity level of five to six. Overall, complete the warm-up, seven cycles of burst/recovery periods and a five-minute cool down. Use any form of cardio for HIIT, such as jogging, bicycling or rowing. A common misconception within the fitness world is that you are able to isolate the upper and lower abdominals with specific exercises. While it’s true you may stimulate a higher degree of lower abdominal muscle fibers, it’s impossible to independently work the lower or upper abdominals. When it comes to training frequency, strive to train the abdominals three to five days per week. Each training session should consist of not only lower abdominal exercises, but also upper and oblique training. Engage in five to 10 abdominal exercises in each training session, and prevent muscle adaptation by altering exercises and intensity levels every two weeks. Bodyweight training fatigues your abdominals by using gravity to exhaust your muscles. These exercises may use no equipment or minimal pieces of equipment such as a weight bench. Lower abdominal bodyweight exercises typically involve lifting the legs while curling the hips inward. For example, the bent-knee hip raise isolates the entire abdominals while focusing on the lower abs. Lower yourself to the floor and place your hands palm-down by your hips. While keeping your knees bent, the curl your knees up toward your chest while simultaneously lifting your buttocks off the floor. Flat Bench lying leg raises, seated leg tucks and air bikes are other examples of effective lower abdominal bodyweight exercises. While bodyweight exercises help define the abdominals, if you feel you need an extra challenge, adding resistance to lower abdominal exercises may be just the ticket. Before adding resistance to your exercises, make sure you’ve mastered exercise movements. Although adding resistance is acceptable, keep the weight load relatively light. You may use dumbbells, such as in the dumbbell push crunch exercise, or weight machines. If you’re relatively new to abdominal training, choose weight machines for lower abdominal training. The lever seated leg raise crunch is an effective machine exercise. However, you may increase intensity level by adding ankle weights to exercises such as the weighted lying leg-hip raise. 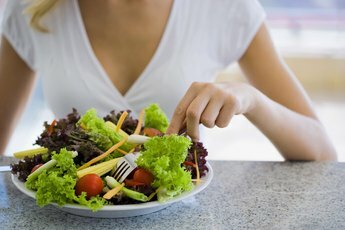 What Is a Good Exercise Regimen for Women to Lose Weight? What Exercises Change the Way a Pear Shape Looks? What Exercise Targets Lower Belly Fat?